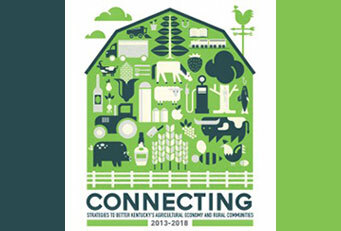 In February 2012, the KAC convened a Task Force representing a broad spectrum of Kentucky agricultural leaders to create an updated strategic plan for Kentucky Agriculture and its rural communities for the 2013-2018 timeframe. Throughout the year, Task Force members and committees developed the plan. Public Forums were held around the state to get additional input. The final plan was presented and formally adopted by the Task Force at the November 8, 2012 Kentucky Ag Summit. Sign up for our mailing list to get information about the public presentation of the Strategic Plan. Download the "What Page Are You On?" form to provide KAC an update on your organization's goals and actions related to the Strategic Plan. At the February 21 kick-off meeting, a three-page, in-depth questionnaire was distributed to all Task Force members, seeking their organizations' perspectives on the importance of various challenges, opportunities and major issues facing Kentucky Agriculture. A Summary as well as numerical results of the tabulated questionnaire results were provided to Task Force members at their second meeting (May 30). Task Force members then had an opportunity to vote on a wide range of "themes" emerging from the questionnaire responses. Voting was conducted anonymously using an Electronic Response System. Seven Committees then were established to begin development of preliminary Goals, Actions and Benchmarks for the top-ranked themes. Following the identification of key "Themes" at the May 30 meeting, Task Force members divided themselves among committees, and began to develop in-depth recommendations for Goals, Actions, and Benchmarks (outcomes) under each theme. At the July 11 meeting, Task Force members primarily worked within their respective Committees to further develop this material. The Committee-defined topics have been further refined to reflect input from the KAC Board of Directors, and to ensure that issues and goals that were part of the original 2007-2012 strategic plan receive continuing attention where needed. Council for Burley Tobacco, Inc.